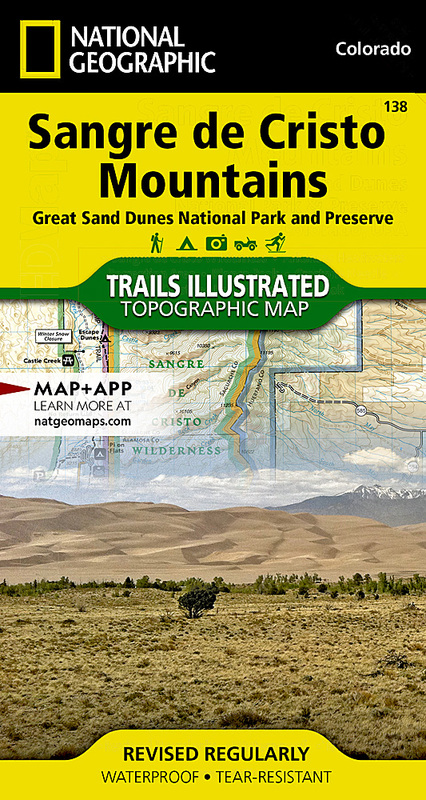 Explore the majesty of the southern Rockies and the wonder of the Great Sand Dunes with National Geographic's Trails Illustrated map of Sangre de Cristo Mountains. Created in partnership with local land management agencies, this expertly researched map delivers unmatched detail and helpful information for experienced outdoor enthusiasts and casual visitors alike. Some of the key areas of interest included are: Great Sand Dunes National Park and Preserve; Arkansas Headwaters Recreation Area; DeWeese Reservoir; Blanca Wetlands; San Luis State Park; and portions of Rio Grande and San Isabel national forests. This map can guide you off the beaten path and back again with miles of mapped trails and clearly marked trailheads. Cyclists will appreciate the detail paid to the many hard surface and mountain bike trails in the region. Road types are differentiated as well, so you know if the route you choose is a paved, dirt, four-wheel-drive, or high-clearance road. Some of the many recreation features noted include campgrounds, cross country ski areas, snowmobile trails, fishing areas, boat launches, rafting put-ins, and scenic viewpoints. The map base includes contour lines and elevations for summits, passes and major lakes. Other features found on this map include: Blanca Peak, Challenger Point, Crestone Needle, Crestone Peak, Electric Peak, Great Sand Dunes National Park, Great Sand Dunes National Preserve, Humboldt Peak, Kit Carson Mountain, Little Bear Peak, Mount Lindsey, Promontory Divide, Rio Grande National Forest, San Isabel National Forest, Sangre de Cristo Wilderness.